Throughout history, quince have been associated with romance and commitment, a gift from Aphrodite. By the early 18th century, this unique fruit had found its way to the United States. Although quinces are a staple in savory Moroccan tagines, North African and Middle Eastern stews, Chinese teas and Hindu chutneys, in America, they are mostly poached in a light syrup, used as a pastry filling or made into a sweet paste and served as an accompaniment to cheese. We are at the very end of quince season, so I thought I'd jump in before we forge our path into a new year. It's hard to believe we've breezed right through the 2012 holiday season, but here we are. This dessert is composed of an Olive Oil Sponge Cake that is one of the easiest and tastiest sponge cakes you'll ever make. It's my very favorite of its kind. 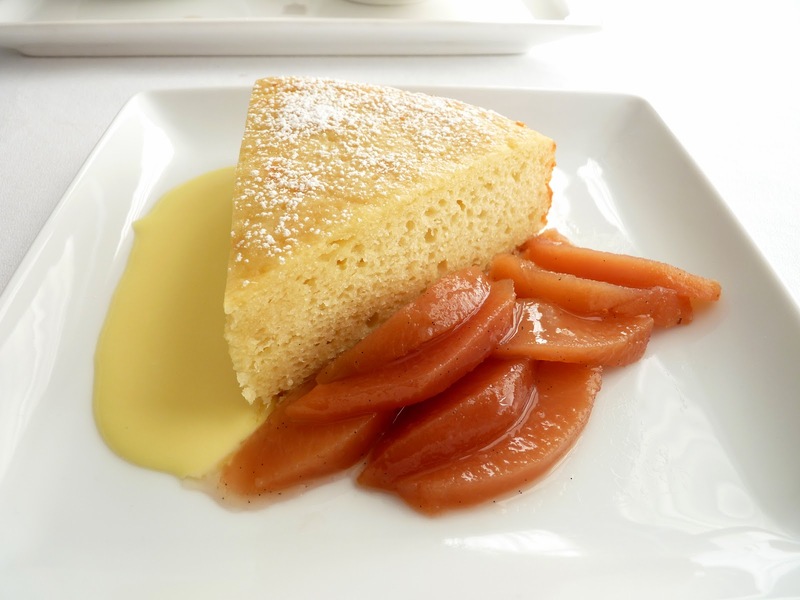 The quince compote is served alongside the cake with a helping of crème anglaise, a classic French dessert sauce. The contrasting combination of textures and lightness and richness is more than satisfying for fans of each. If you don't have time for the sauce, vanilla ice cream is purely perfect as a delicious accompaniment. Wishing you a really terrific New Year's celebration with close family and friends and sending heartfelt thanks for your lovely companionship here at my blog. Let's set our tables in 2013 with great friends, sumptuous meals and beautiful pastry. Cheers!! - Quince compote can be made ahead and stored in an airtight container in the refrigerator for several days. The sponge cake can be made, wrapped in plastic and stored in an airtight container at room temperature one day ahead. (It also freezes well.) The crème anglaise can be made one day in advance and stored in an airtight container in the refrigerator. - Be care when peeling and cutting into quinces. They are very hard and will take steady but careful force. Use a sharp chef's knife and a non-slip work surface and watch your fingers. I find them easier to work with if they are first cut into quarters. 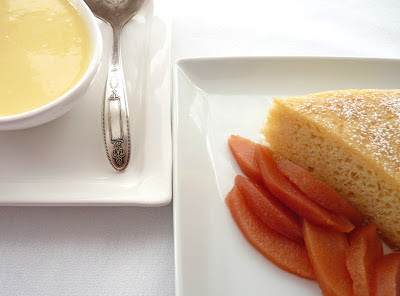 - I like a crème anglaise that is less rich than most recipes, so I use whole milk rather than cream. If you prefer a richer sauce, you can substitute 1 cup half-and-half (or 1/2 cup heavy cream and 1/2 cup milk). For the quince compote, bring the water, sugar, vanilla bean, cinnamon stick and citrus peel to a boil. Lower heat to a simmer. Cut the quince into quarters and then peel and core them. Cut them into 1/2" slices and place in the simmering syrup. Bring to a boil. Press a round of parchment paper onto the top of the mixture to hold in the steam. Reduce heat to a low simmer and cook, stirring occasionally, until the quinces are tender and have turned a deep rose color, about 1 1/2 - 2 hours. Cool and transfer the fruit and syrup to a clean airtight container and chill. Prepare the sponge cake and cool completely. For the crème anglaise, bring the milk to a simmer. In a separate bowl, whisk the egg yolks and sugar until thoroughly combined. Add half the warm milk to the yolks and whisk together. Add remaining milk and whisk thoroughly. Pour the mixture into the saucepan and return to low heat, stirring constantly with a wooden spoon or spatula until the mixture thickens slightly. Do not boil. The sauce is ready when it coats the back of the spoon and a finger traced through it leaves a clean track, about 3 - 4 minutes. Remove from heat and immediately pour into a clean bowl to stop the cooking. Add vanilla and cool. 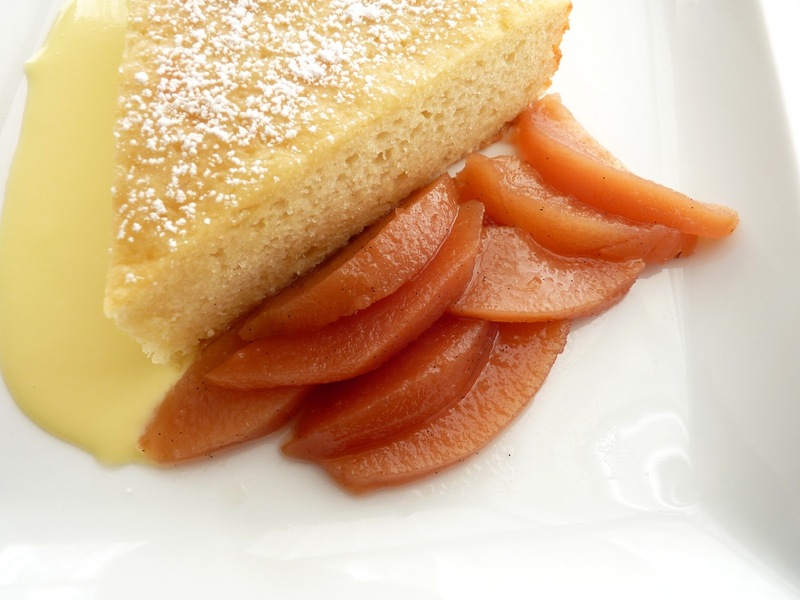 To serve, plate a slice of cake and garnish with thin slices of quince and crème anglaise. If you have some brunches with family and friends coming up on your horizon, this is a very easy little brunch cake that will serve 8. This cake is light, very tender and presents a nice layer of tart raspberries for a bright splash of both flavor and color. 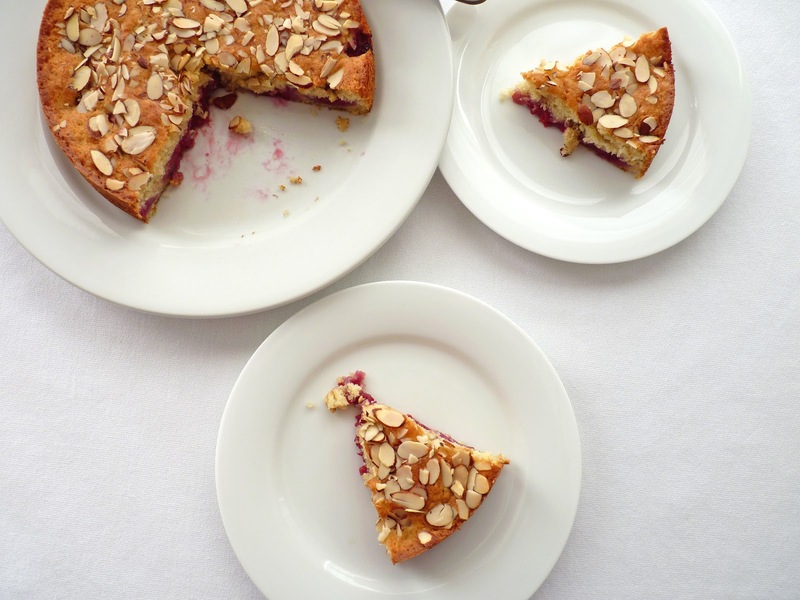 The almonds are a perfect garnish, adding just enough texture and nuttiness to the mix. The raspberries are macerated in some sugar to sweeten them up and a bit of lemon juice to boost their flavor. There's buttermilk and melted butter in the cake for extra tenderness. Along with the jammy fruit, each bite sort of melts in your mouth. What I like about this cake is it's not heavy or too sweet, so it doesn't ruin your appetite for a full day of festivities. Add it to your Christmas morning table along with steaming hot coffee and tea and enjoy the start of your holiday. Cheers! - Most commercial cartons of raspberries are equal to 6 oz. - The raspberries should macerate for about 10 minutes or the time it takes to assemble and mix the remaining ingredients. - There isn't a lot of batter but you will get two thin layers out of it. - Be careful when removing the cake from the pan. It's tender and a bit fragile while still warm. Preheat oven to 350 degrees. Lightly grease an 8" cake pan and line the bottom with parchment. Combine raspberries, sugar and lemon juice and set aside to macerate. In another bowl, whisk the egg, sugar, buttermilk, melted butter and vanilla. Use a fork to stir in the flour mixture and mix until moistened and there are no streaks of flour. Spoon a little over half of the batter into the prepared pan, making sure to cover the entire bottom surface. 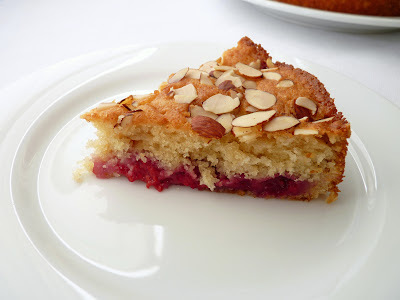 Top with the raspberry mixture. Dollop the remaining batter over the raspberries and spread out in an even layer. There will be some raspberries exposed and that's fine. Sprinkle with sliced almonds. Bake until a tester comes out clean, about 30 minutes. Cool on a wire rack for 10 minutes. Run a thin knife around the edges and gently turn out the cake. Invert again onto a platter. Cool. Serve warm or at room temperature. It's been quite a long time since I've had Pain d'Epices, a French spice bread typically made with rye flour, honey and spices with origins that date back to the Napoleonic era. When I worked in a French bakery, we produced it every week. The texture is usually dense and it's often served as an accompaniment to savory food at holidays. 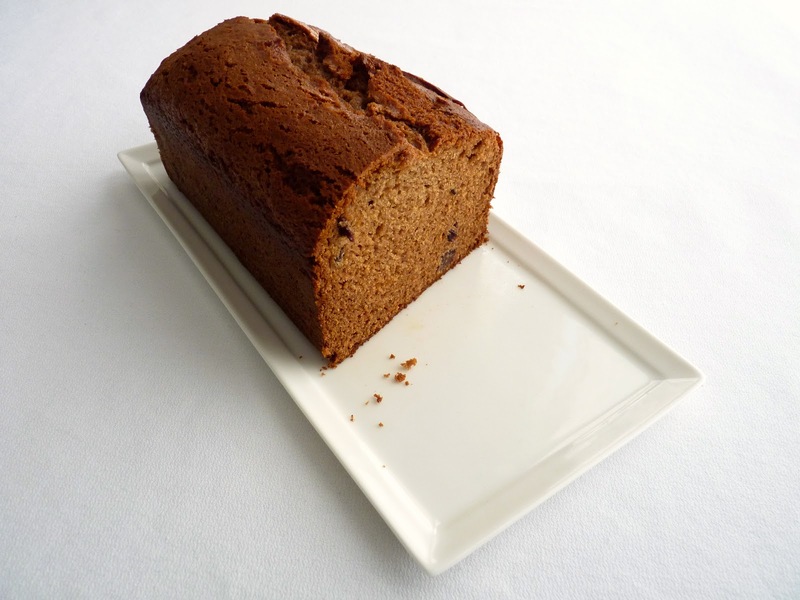 This loaf cake is different but somewhat in the same vein, although it has the texture of cake rather than bread. The focus is really on the interplay between the raisins and the anise seeds, which I think are well matched. There's a touch of whole wheat flour to keep the taste fairly rustic. It's plain in nature and would pair well with a smear of soft cream cheese. In this season of strong flavors and textures, I like the subtle flavor and the soft crumb of this cake. So while it's a fairly simple and understated composition, I think it's still worthy of a holiday brunch table or afternoon tea or coffee affair when you feel a momentary urge to stray away from the usual seasonal loaf cakes and breads. 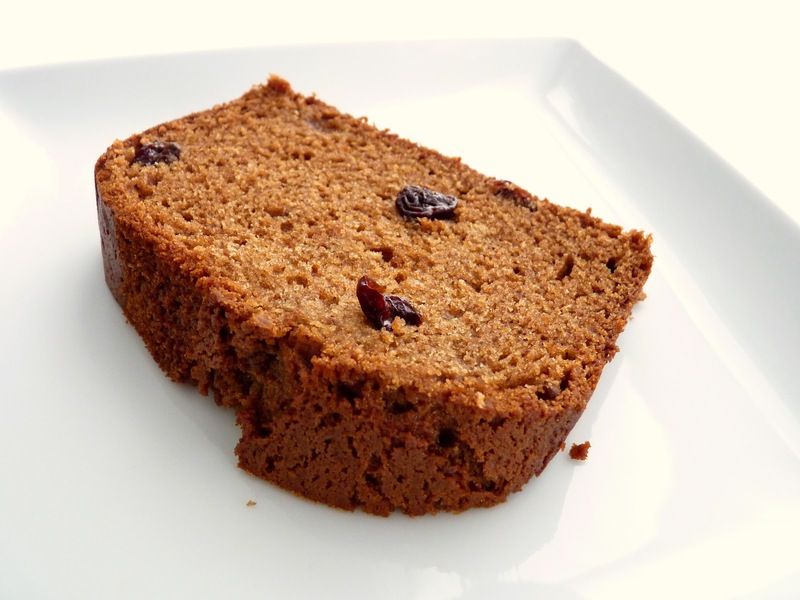 - Plump the raisins by pouring hot simmering water over them and letting them stand for 1/2 hour. Then place in a strainer and drain for 5 minutes. 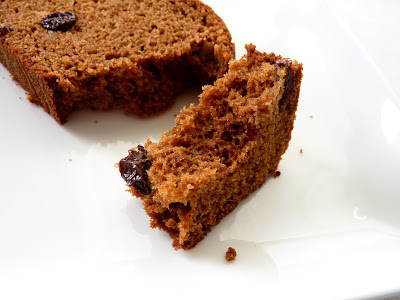 - As with most spice cakes and cookies, this tastes better the next day. The cake will keep for a few days wrapped and placed in an airtight container. Preheat oven to 350 degrees. Lightly grease an 8 1/2" x 4 1/12" loaf pan and line with a piece of parchment paper large enough to form an overhang on both sides along the length of the pan. Sift together the flours, baking soda, salt and all the spices. In a separate bowl, whisk together oil, eggs, honey and sugars until smooth. Add the vanilla and orange zest. Alternately add a third of the flour mixture and half the buttermilk, beginning and ending with the flour. Mix just until the batter is blended and has no streaks of flour. Stir in plumped and drained raisins. Pour into prepared pan. Bake until the cake springs back when lightly touched and a tester comes out clean, about 50 minutes. Cool on a wire rack. Remove from pan and peel off the parchment. This chilly wet weather seems to be inviting thoughts of comfort food. 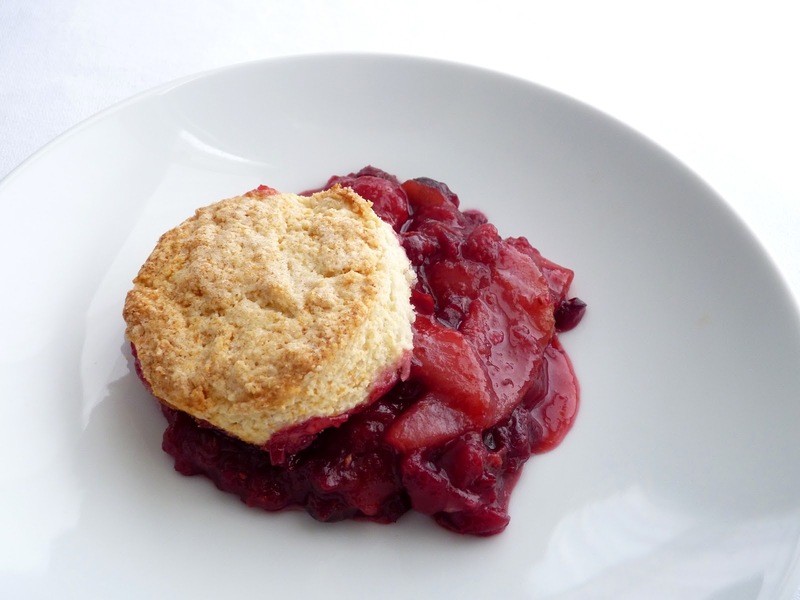 And among the most satisfying of comfort foods in the realm of pastry is fruit cobbler, a good old-fashioned spoon dessert. 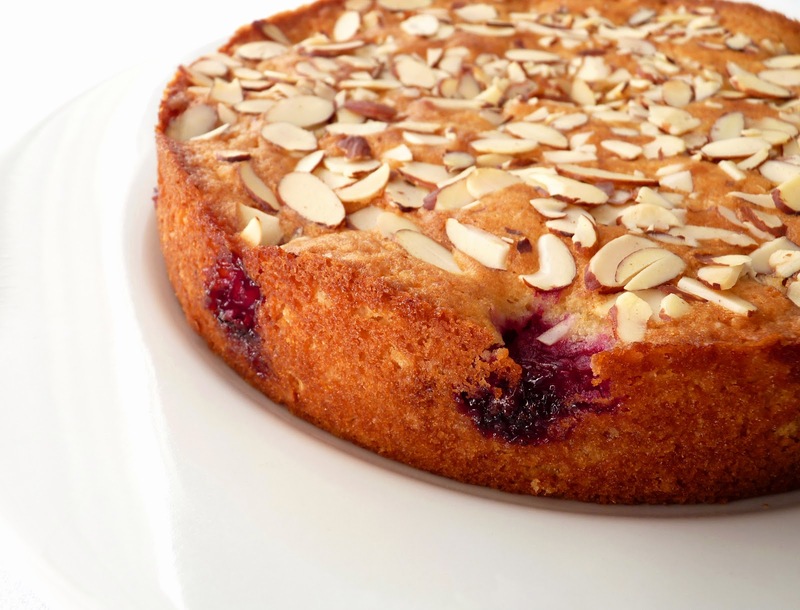 This is a winterized version with a pear and cranberry filling. The fruit is tart and spiced with a touch of cardamom. The biscuit topping is tender and perfect for soaking up the juices. And it's a welcome dose of bright color in a season of spice cakes and chocolate. The cobbler is easily tossed together, something you can appreciate if you're beginning to feel the stress of many, many errands. The fruit is first baked in the oven to soften and release the juices. Then the biscuits are spun together and placed on top of the bubbling filling and baked until they're golden brown. Easy, familiar and of the season. Serve warm for a nice dose of simple comfort in the midst of the rain and all the holiday preparations. - Pears should be ripening but firm. I used D'Anjous. - I love tart desserts but you may want to sample the fruit halfway through cooking to see if you'd like it sweeter. Then add sugar accordingly and continue to bake. - Stir the sour cream before measuring to integrate all the liquids. You can substitute heavy cream or buttermilk for the sour cream. - Place the baking dish on top of a baking sheet to catch any potential spillover as the fruit cooks. - Gild the lily with a scoop of ice cream! Preheat oven to 375 degrees. Lightly butter a deep 9" pie or square baking dish. For the filling, peel and core the pears and slice into 1/4" wedges. Place them in the baking dish and toss with the cranberries, sugar, cardamom, orange zest and water. Cover the dish tightly with foil, place on a baking sheet and bake for 20 minutes. Remove the foil and bake for another 20 minutes. While the fruit is baking, prepare the cobbler biscuits. Whisk together the flour, sugar, baking powder, baking soda and salt. Cut the cold butter into small pieces and add to the flour mixture, tossing to coat each piece. Using your fingers or a pastry blender, work the butter into the flour until the mixture looks like coarse meal. Make a well in the middle of the flour mixture and add the sour cream into the well. Using a fork, fluff the flour into the center and gently stir and turn the ingredients. It will look lumpy and clumpy. Turn out the dough onto a work surface. Give it a very gentle kneading. About 3 - 4 turns should be enough to consolidate it. Pat into a round about 7 1/2" in diameter and nearly 1 1/2" thick. 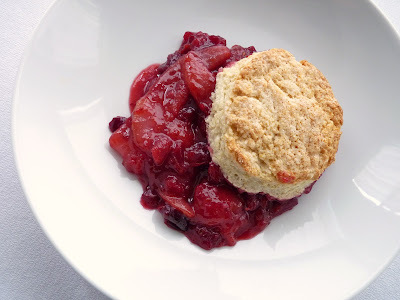 Use a 2" or 2 1/2" cutter to form the biscuits. 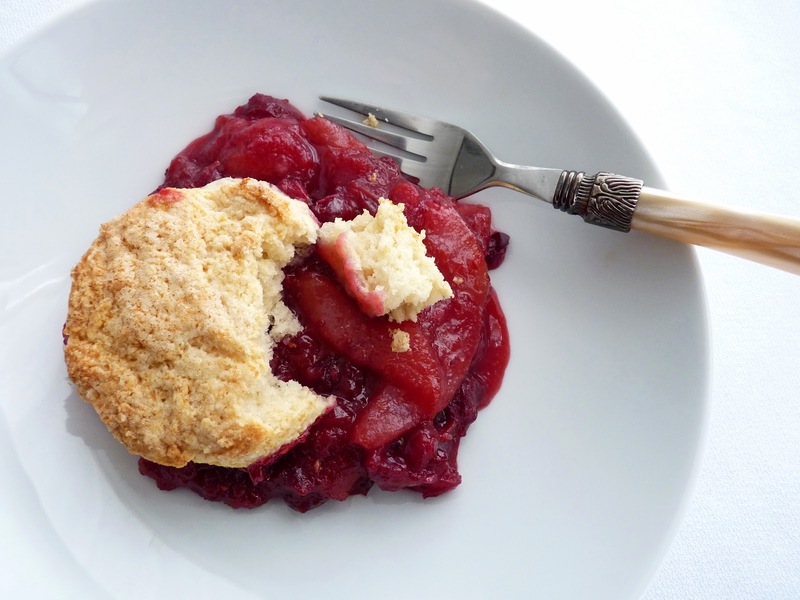 Gather the scraps and gently press and pat them into an additional biscuit. When fruit is ready, place the biscuits on top. Brush the tops with melted butter and sprinkle lightly with sugar. Bake until the filling is bubbling and the biscuits are golden brown, about 25 - 30 minutes. Serve warm or at room temperature.